This 1926 Royal 10 a fun machine to type on. and they look great too! This 1928 Underwood No. 5 is a great classic typewriter. I like this machine so much I put it on my business card. This 1938 Underwood Master Model is impressive looking. I had many customer comments on how masculine this machine looks. This Royal HH is very common and has a nice touch. This Super Speed has a very unique touch. Those are some big standards, to be sure. The Underwood Master looks quite hulking and impressive. 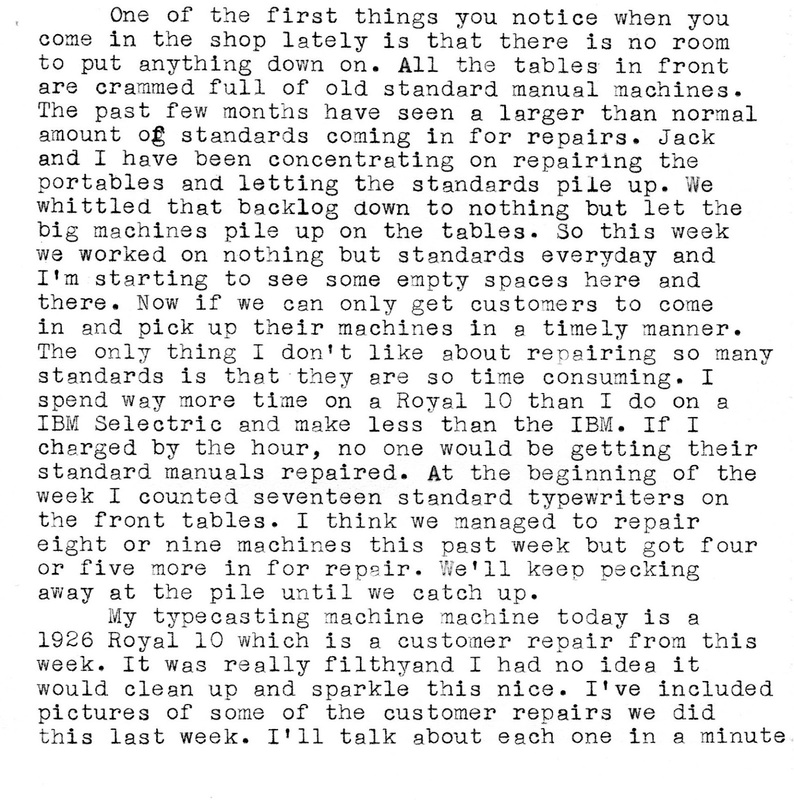 The 10 seems to type rather nicely and clear, and all of the machines look fantastic! Good luck with your ever growing pile of standards! Great work on the standards. The Royal 10 and Underwood 5 have been 2 of my favorite wants and at the top of my wish list and never purchased for lack of room for any standards in my house. Another fun typecast. The owner of that Royal 10 must have been dazzled and delighted to see how it came out. 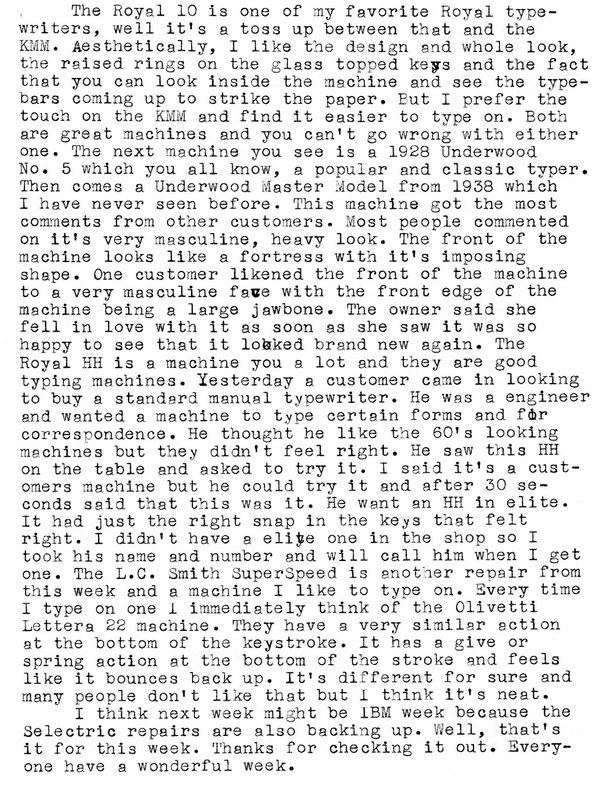 The Underwood Master is indeed one BEEFY machine! 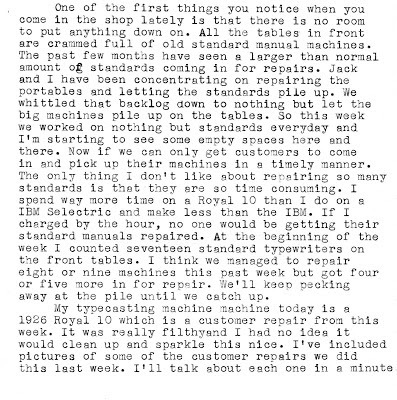 Oh yeah, 17 standard typewriters up for repair! They keep coming, don't they. That Royal 10 is a stunner! Those are monsters, for sure. The HH is second only to the FP as my favorite Royal. Horrible, horrible person. I've been lusting after a Royal 10 and an Underwood 5 or ages. I so do not need to be looking at pictures of these machines right now. :) But they are lovely and you did a wonderful job on them. Ken- Everything comes at me in waves. Next month, waves of IBM's or something else will come through the door. Bill- I hope everyone can make room for their favorite standard. They are fun to type on. Richard- There's not too many machines you can call beefy. Thanks for you generous comments. Ton- Yeah! They keep coming. I've been trying to catch up for two years now and haven't. Notagain- I really like the FP too. I've got a nice one with earmuffs I've been thinking of painting a different color. 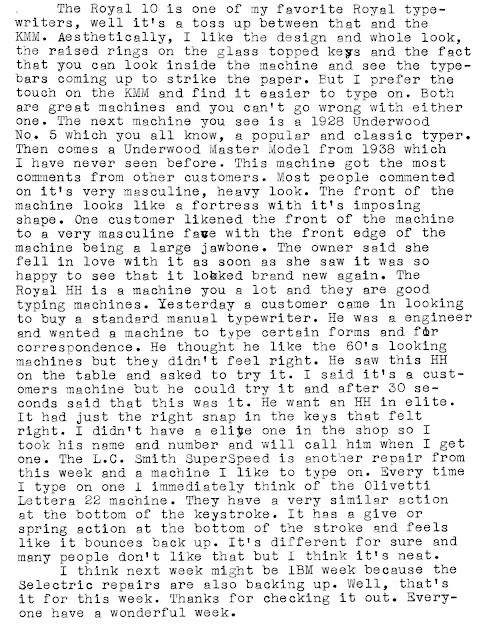 Sophia- You should treat yourself to an early birthday present and find a beautiful standard typewriter. You'll be glad you did. Thanks for your comments! If I weren't moving in six weeks, then I would be sorely tempted (I am tempted now). At this point, however, I don't know if I will just be moving down the street or to another state. I may contact you once I'm settled in wherever I end up (though, considering option B is in Massachusetts, I might just swing by in person!). I truly enjoy typing on my Royal Model 10 and Underwood 5. They're wonderful machines, although they certainly *DO* take up a great deal of room! Another favorite is my Remington Model Seventeen. It's the only one in my collection with bakelite keys. Very satisfying and comfortable to type on. Gee, they come up looking shiny and new after they've been through your door, Tom! Nice work. We gotta figure out how to clone you and get you down to Australia. Or rather, your double. Oooooh. Standards! My favorite. They all look so shiny and office-like. The Ten is lovely, of course, as is the HH. The Underwood is very...beefy as someone said above. My own Underwood is not nealy so big. I have one of those LC Smith machines, but mine looks like it has been under water for an extended period of time. I was going to try dunking it in Evapo-Rust and see what happens. It certainly couldn't be any worse. Cameron- I finally got a Underwood No.5 last year for home but haven't finished work on it yet. Glad to hear you enjoy your standards. I didn't know the Rem. 17 had bakelite keys. I'm holding one for Matt Cidoni if he ever makes it up from N.J.
Teeritz- Thanks for your comments. If anyone invents a teleportation machine, I'll be right down. Ryan- Do try the Evapo-rust. It really does work but the trick is to quickly hose down your machine and dry it off. Otherwise it gums back up after a few hours. Richard uses it and swears by it.